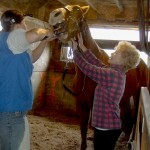 Monday, October 24th 2011, I drove to the barn to help Johnn with the horses; the equine dentist was coming. Not long after I arrived, Donna stepped into the barn, retrieved her brushes and started cleaning mud off Socks. We chatted for awhile then I went into the tack room, got my gear and brushed down Pepper and CJ. It wasn’t long before a tall, young woman pulled her car into the driveway in front of the barn and stepped out. She carried a large pail filled with tools and a solution of water and disinfectant. The equine dentist, Brianne Good, grew up owning horses, showing at local 4-H shows as well as riding English and Western at open shows and the Quarter Horse circuit. 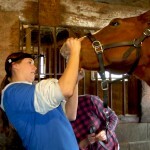 She attended Morrisville State College in Morrisville NY majoring in Equine Science and Management. 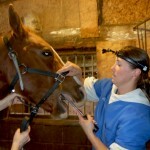 In 2005, Brianne apprenticed with Dave Brown an equine dentist, and attended the American School of Equine Dentistry in Ocala, FL. She travels throughout Northeastern US and occasionally as far as California to perform her work. Fortunately for horse owners in Northeastern PA, she lives in Towanda; a short drive from Ballentine’s Horse Heaven. In their stalls, the horses waited to have their teeth floated. Brianne greeted us and started to work. Skillfully, she fitted a strange, heavy metal instrument, much like a bit, into Socks’ mouth. Socks’ incisors rested upon the speculum’s metal plates and a leather strap went around his nose. 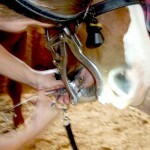 The speculum prevents the horse from closing his mouth, so the equine dentist can work on the teeth. 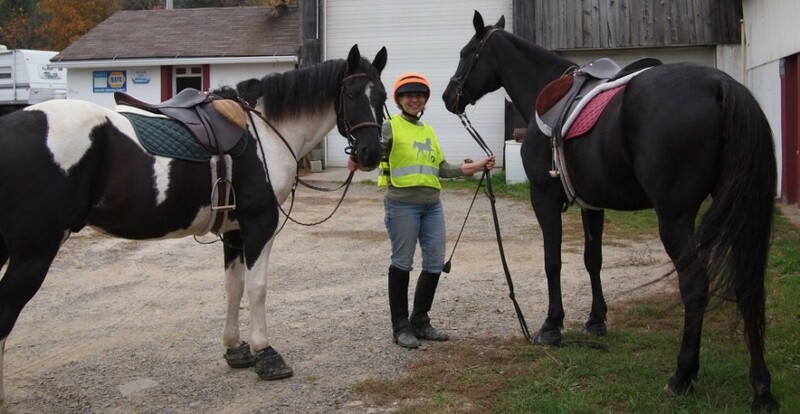 As she worked, Brianne spoke about horses, bad hay, travels, experiences as an equine dentist, and her profession and training; all of which helped relax the horse. In Brianne’s pail were several files with long handles. 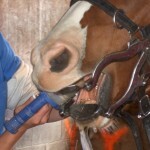 These files, called floats are used to file down the rough edges of the horse’s teeth. 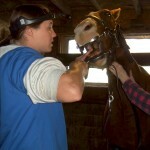 A horse’s upper jaw is wider than the lower jaw. Their teeth never stop growing, and when a horse eats he grinds his teeth from side to side. This grinding wears down the molars resulting in sharp edges forming on the outside of the upper molars and the inside of the lower molars. To prevent these sharp teeth from cutting into the tongue or cheek they need to be filed annually by the equine dentist or vet. Brianne rounded the edges off Socks’ molars; then she stopped, stuck her hand deep into his mouth feeling for sharp, rough edges, and started filing again. Socks calmly stood for the procedure much like you would sit in the dentist’s chair sometimes tense but then relaxing and letting the dentist do the work. She took out a tool, a compound rongeur, with a long handle specially shaped to fit over a horse’s canine teeth. After Brianne fitted the tool, she pulled off large chunks of green plaque from Socks’ teeth. Once she finished, off came the speculum and Brianne began filing the outside edges of the incisor teeth. Finally, Socks was ready for the rinse off. Brianne used a water bottle with a long metal tube to flush out tooth matter and plaque loosened during the filing. And that was it, Socks received a clean bill of health from the dentist and Brianne moved on to the next horse. 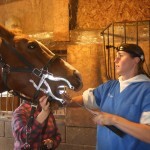 Last year the vet floated the horse’s teeth and CJ was sedated. No one was sure how CJ would behave. He stood and Brianne floated his teeth, only once moving away from the dentist. I circled him around his stall bringing him back for her to finish filing his teeth, then Brianne moved on to Pepper, Jupiter and Myrtle. Myrtle, a Belgium, really didn’t want to have her teeth floated, and reared several times protesting the procedure. Brianne stood her ground and continued to work on the huge horse. Johnn held tight to the lead rope, while Donna and I stood out of the way behind the stall gate. Finally, Myrtle’s teeth were rounded, smoothed and rinsed. Brianne packed up her tools and we said good-bye. It will be a whole year before she comes this way again. For more inromation about Brianne Good her website is BGoodEQDT@yahoo.com. 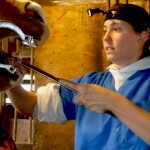 This entry was posted in Uncategorized and tagged Brianne Good, equine dentist. Bookmark the permalink.